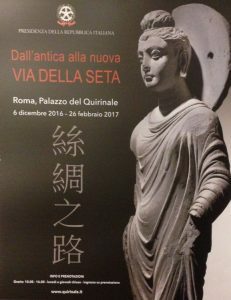 A brief report just for you from my preview of the spectacular Via della Seta Exhibition at Palazzo Quirinale in Rome, opening December 6, 2016 and closing February 27, 2017. The exhibition analyzes the role of cartography, giving prominence to one of the most superb maps that ever reached modern times: the Fra Mauro map. On Monday, the publisher Imago invited me to the opening of the Via della Seta exhibition, which had as its venue Palazzo Quirinale, Rome. The exhibition, that will be closing February 27, 2017, takes its name after the german Die Seidenstrasse (in English “Silk Road”), a term first coined in 1877 by Ferdinand von Richthofen. 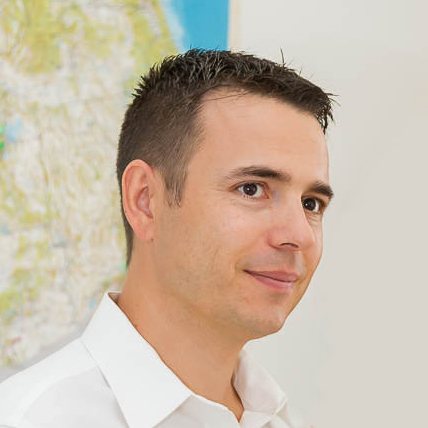 The geographer was particularly interested in the routes that from China, and Central Asia in general, lead to Europe, for it was through those that for many centuries significant trading took place, facilitating the entry of Asian culture – and Asian inventions – in Europe. 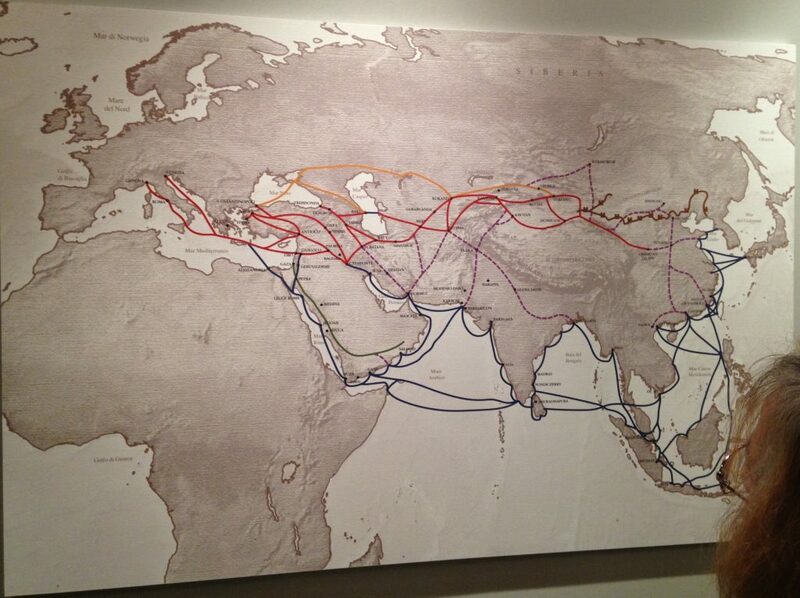 The Silk Road played a significant role in the trading business which developed along two main routes: a northern and a southern one. For this reason, the exhibition majorly focuses on the importance of cartography, a key science to traders who, traveling around the continents, relied on maps on a daily basis. On account of this, the curators Louis Godart, David Gosset, and Maurizio Scarpari, designed the exhibition around the role of Asia-related cartography from the II to XVIII century. Through the analysis of these specimens, it is possible to understand the developing of the interpretation of the geographic space, which ranged from the concept of a geometrically defined space to one based on and filled with narrative and religious elements. 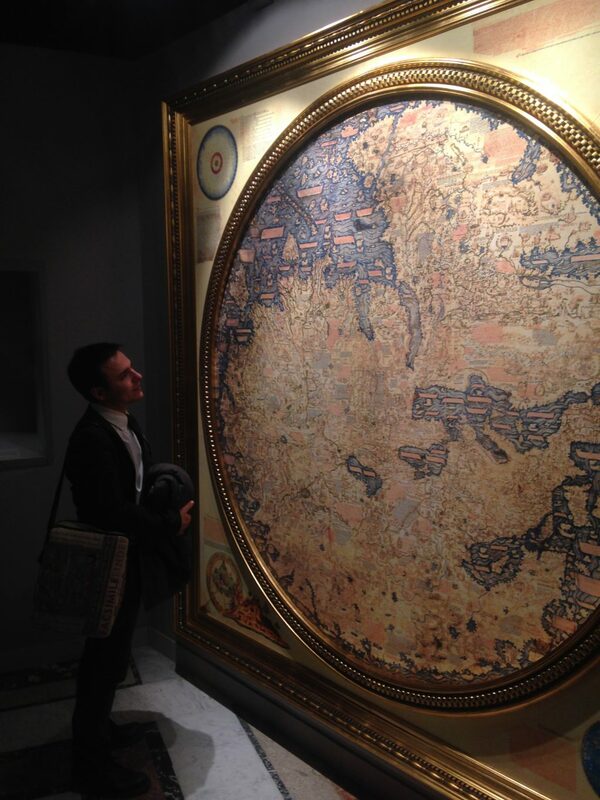 One of the most impressive testimonies of the exhibition is justly represented by the Fra Mauro map, due both to its magnificence and significance of geographic contents. The map, completed in 1459, denies the scientific and innovative elements of the ptolemaic method; nevertheless, it is an extraordinary detailed synthesis of the geographic knowledge of the time, offering extensive insight, such as the evidence concerning the presence of Chinese ships in the Indian Ocean and along the African East cost. The Fra Mauro map provides a depiction of Asia created on the basis of countless data and information, collected from the most disparate sources, written and oral, ancient and contemporary, literary and cartographic, making it unprecedented for size and details, and partially relying on the Ptolemaic model of Asia. Among the many sources that cartographer drew from, for the creation of their maps, were travel diaries of merchants, traders, and religious people that would travel far for business or to sponsor their beliefs. In this regard, the exhibition gives prominence to one of the most famous Italian travelers of the world, Marco Polo, author of Il Milione. So if you fancy a trip to Asia, do not hesitate to treat yourself with a view of Via della Seta exhibition, and the Fra Mauro map!